In today’s Gear Corner, we’re going to discuss a unique specimen of solid state amplification: the Sunn Beta series. Sunn was a brand with a fairly long and interesting history, but today let’s focus on the late 70’s. In 1979, after moving all forms of production back to the original factory in Tualatin, Oregon, the Hartzell corporation-owned Sunn decided to announce a new line of amps to meet the needs of the musician of the 80’s. The company had long been building mostly solid state amplifiers, and they never had the same success with guitar players as they had with bass players. This new line would be light, easy to use, and involve channel switching and more of an emphasis on the distorted sounds made so popular in the 70s. The flagship of this line would be the Beta, and today we will discuss some notable users, interesting techincal aspects, and the various models within this line of amps. The Beta series was rolled out with quite a few options for the guitar (or bass) player in 1979. Sunn featured heads, and what they referred to as “Self-Contained Amps”, commonly known as combos. There were two main amps in the Beta series, the Beta Lead and Beta Bass. Although the Lead was marketed to guitar players specifically, the only difference between the Lead and Bass is the lack of reverb on the Beta Bass. Which, considering the reverb on these amps is nothing spectacular, this means that any guitar player looking for the Beta sound can easily acquire a Beta Bass instead of waiting around for the (now more expensive) Beta Lead. 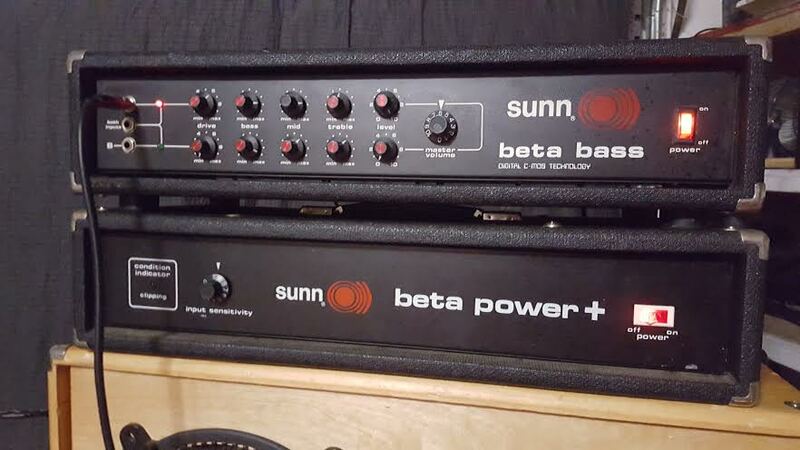 Sunn also offered the Beta Power +, a combo amp that contained the power section of the Beta series. This way, if you needed more volume, but didn’t want to worry about a complicated mutli-amp set up, you could simply run several Power + combos via the preamp of your Beta! Sunn also introduced the Alpha series along with the Beta, which featured the Alpha 112, a 1×12” combo amp that was simply one channel from the Beta. But, the Alpha also featured a parametric Mid control, allowing the user to shift the center frequency of the midrange control. Along with the Alpha 112, the Alpha series included the Alpha Slave, which was essentially the same unit as the Beta Power +, but in a headshell form for those using separate cabinets. On top of all of these elaborate choices, there was the Sunn PL-20, a rack mounted unit that was the preamp from the Beta Lead without any power amp. This allows users (such as Buzz Osbourne, who uses two of these in his live rig currently) to use a larger power amp, and to mount all of these components in a more road-ready rack setup. Altogether, Sunn really offered a huge amount of amplifier options in the Beta line. The Beta series took advantage of many advancements in solid state technology in 1979, and also utilized a lot of very interesting ideas to create an amp with a truly unique sound. Featured prominently on the front of the amp is the label “DIGITAL C-MOS TECHNOLOGY”. Aside from probably sounding fairly futuristic at the time, this C-MOS technology plays a huge part in the overall sound of the Beta. C-MOS chips are constructed from a combination of MOSFETs to create logic gates. They’re not intended for audio use, but it can be used as a linear Integrated Chip in order to provide amplification. And when they distort, they provide soft clipping, much like in tube amps. They can also be found in many great pedals, including the Way Huge Red Llama and the Electro-Harmonix Hot Tubes Overdrive. The EQ in the Beta is also unlike most amps. On the surface, it appears fairly normal, a 3 band Bass-Mid-Treble EQ. But, each control is actually an active boost control (centered at 20-400 Hz, 400-1400 Hz and 1400-20,000 Hz respectively) that goes from “Off” (no boost) to roughly 30 dB of boost. Couple this with a very powerful 100W solid state power amp (don’t roll your eyes, this amp is LOUD! ), and you get the aggressive and powerful sound of the Beta. Although the Sunn Beta series was not an initial success, these amps have found quite the cult following in recent years. Throughout the late 80’s and early 90’s (after the Sunn brand was sold to Fender to serve as their PA equipment wing), many prominent musicians made use of the Beta. Buzz Osborne of the Melvins has been a prominent user of the Beta from early in his career, and this inspired Kurt Cobain to use a Beta Lead throughout “Bleach” era Nirvana. Adam Jones from Tool used one alongside his Marshall 1959 Super Lead and his Diezel VH4. Another prominent Marshall user, Slash, once stated that the Beta was his “first decent amp”. And in recent years, bands such as Red Fang (who used Beta Leads for every instrument, including bass), No Age, and Tenement have made prominent use of the Sunn Beta. Interested in buying, selling or trading a vintage piece of equipment such as the Sunn Beta? At McBride Music and Pawn, we actively purchase and supply fine vintage and used musical equipment to not only the Denton, TX area, but across the entire world via our eBay and Reverb storefronts. You Can Pawn Classic Car Parts – Yes You Can! ray ban outlet online on How Do Pawn Loans Work? McBrides Music and Pawn is the oldest pawn shop in Denton, has served over 100,000 customers, loaned millions of dollars to the community and stayed in the same location since 1968.